Trade Classics > Classic Car Blog > What are the best classic car shows in the UK? What are the best classic car shows in the UK? 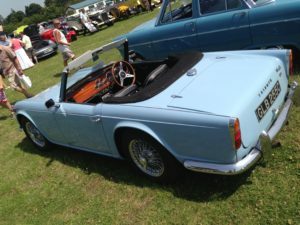 Classic car shows are a favourite pastime in the UK, however, what you may not know is they aren’t just summer events only; they are year round with regular events happening in Autumn and Winter time. In this article I’ll list the most popular and regular classic car shows and the usual month in which they are held. If you think classic car shows are just that, i.e. people just parking their highly polished cars up for others to admire then think again! Of course this is a large part of the fun, however, shows are competing with each other to attract more visitors by laying on different events and themes. For example, the Goodwood Revival is a period show, i.e. participants are encouraged to dress in bygone fashion appropriate to the age of their car – this makes a great event for the whole family and really brings the ‘golden age of motoring’ to life. Then there are concours events to find the very best of a specific mark or type of car. Also, for the enthusiast you’ll find some great autojumbles to root around in looking for that hard-to-find part. The Beaulieu Autojumble is actually the largest event in Europe to find spares and accessories for classic cars in Europe. If you are after a specific part and had no luck finding it on the internet then this show may be for you – at the very least it will be a great day out and you’ll meet lots of like-minded people to chat to. In my opinion, the events below are really the biggest and best classic car shows in the UK with the most amount and varied activities to keep the whole family entertained. However, there are literally hundreds of shows up and down the country from small village fetes to specific shows catering for a specific mark of car. It’s always a good idea to keep and eye in your local paper for smaller events in your local area. For example, I particularly enjoy the Retro Warwick Car Show in August each year – it’s only a small event with about 100 cars but is located in the beautiful town of Warwick and attracts a variety of classics including bikes, mopeds, van and cars. It’s free to view and a great way to spend a Sunday afternoon. Description: Thousands of visitors enjoy the largest show in the UK featuring almost all makes of classic cars. It’s a fantastic place to meet both traders and individuals under one roof. Description: The Goodwood Festival of Speed is a fantastic family event with lots of classic and F1 cars on show. Exciting race events scheduled during the weekend. Over 150,000 visitors enjoy this classic car festival each year. Description: Over 7000 cars will be on show together with around 1000 competiting in race events. It’s billed as the biggest classic motor racing festival in the world! Description: The North West’s biggest event with over 2000 classic cars on show. A large part of this show is concours with over 140 awards up for grabs. So get your car in tip top condition and enter it in one of the categories. Description: This is the largest autojumble in Europe and if you cant find that special part here then it probably doesn’t exist. There are over 2000 stallholders selling all types of autojumble for every make of classic car possible. Description: This is the only period theme event in the world. It attracts thousands of visitors each year and is one of the major classic car show events of the year.